Our online conference brochure includes all the information you will need about the conference: registration information, registration deadlines, a conference schedule (with CE categories for each session), other CE information, session descriptions (with subtopics listed), speaker biographies, entertainment options, and more. DOWNLOAD THE 2019 CONFERENCE BROCHURE HERE. View sessions and CE category/subtopic information here. Friday Lunch - New for 2019, we have added a boxed lunch option on the registration form for Friday, August 9. This option must be purchased in advance by July 26 and will be picked up in the exhibit hall. Our sponsors are helping with the cost of this meal to help keep your costs low. Lunch on the other days is still on your own with restaurants on-site. The last day for earlybird registration is Friday, July 26, 2019. If you register online after July 26, 2019 or register at the door, the late registration fee is an additional $55.00. After July 26, you will not be able to register for pre-con workshops due to ordering of supplies. After July 26, you will not be able to order Friday lunch or a banquet ticket. Online registrations will be accepted until August 2, 2019. After that date, you must register on-site at the conference. 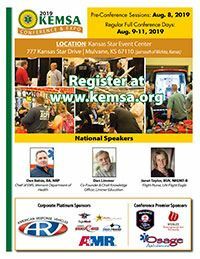 All payments for online registrations must be received in the KEMSA office by Friday, August 2, 2019 in order to confirm your attendance. Payments will only be accepted at the conference for on-site registrations. All other registrations must be paid in advance in order for us to guarantee numbers with the event venue. Complete your online registration using the link above. MEMBERS must login to get the member price for registration. This helps us ensure member get the discounted rate. To get the discount, members must be one of the following: 1) Active member of KEMSA in good standing; 2) Student member of KEMSA in good standing; or 3) Squad member of KEMSA in good standing. Carefully read and complete all information on the online registration form. It is very important that you provide a valid e-mail address for all attendees, so everyone can get their CE certificates. Be sure to check all boxes that apply. Once you complete the registration form, the next screen will display a box to click for online payments by credit card or an invoice. If you want to pay by invoice, you will print the invoice you receive automatically by e-mail and turn it in for payment. A separate invoice will not be mailed. If you need to register more than one person, just add a guest registration for each additional person you want to include. Please note: all guests are registered for the same registration option you clicked on the first screen. Other options on the form can be customized per person. If you register guests, you will get one invoice for everyone. If you have problems with the online form or have questions, contact Mary Napier in the KEMSA office at mary@kemsa.org or 785-580-3459. Must register for these by July 26 and spaces are limited. Thursday, August 8 will be our pre-conference sessions. Due to recent changes in the CE regulations, we have had to adjust our pre-con session times to still get 8 hours and account for breaks. We also have two four hour sessions this year. See full descriptions and details about the pre-con sessions here. Our billing workshop will be Friday, August 9, 2019 from 0800-1700. There is a separate registration fee for this workshop and does not include the regular EMS Conference sessions. It does include access to exhibitors and lunch in the exhibit hall. Read descriptions of all sessions in the conference brochure here. EMS CEU is granted through Hutchinson Community College on an hour-for-hour attendance basis. It is the attendee’s responsibility to follow the CEU rules outlined in the conference packet in order to have valid proof of attendance. Attendees must be present for the entire session. CE Categories for each session are listed on the schedule. We will not be providing nursing hours for the Conference & Expo, but we will provide you with the materials to apply for hours on your own. KEMSA has worked hard this year to provide you with quality educational sessions that help you meet the required components in the new Kansas Continuing Education Plan. Each session has a corresponding CE category (and sub-topics as appropriate) listed on the schedule and session descriptions, so you can determine which sessions you want to attend to help fulfill some of your hours. See details here. 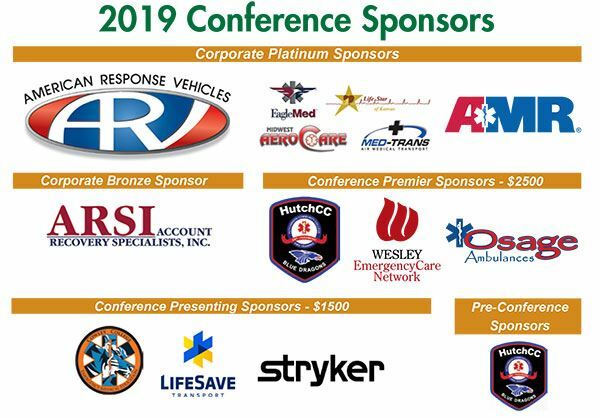 If you wish to help us make this event a success by becoming a Conference sponsor, see our sponsorship opportunities and benefits here. View a full list of our current sponsors here. The room rate is $95/night + tax (standard king or queens) or $99/night + tax (king studios). Breakfast is included with a room. The room rate cutoff is July 19, 2019. Learn more about the hotel here. The early registration deadline is Friday, July 26, 2019. After July 26, you will not be able to register for pre-con workshops due to ordering of supplies. After July 26, you will not be able to order Friday lunch or a banquet ticket. If you register online after July 26 or register at the door, the late registration fee is an additional $55. Payments for online registrations are due by August 2 to confirm your attendance. A conference registration DOES NOT include lunch for any day of the conference, except a new Friday lunch option is available for advance purchase on the registration form. Options are available at the event center. Breakfast is included with a hotel room reservation. The conference registration DOES include breaks each day. A conference registration DOES NOT include a ticket for the Saturday Night Awards Banquet. If you wish to attend, you must purchase a $35 ticket by July 26, 2019. For registrations received after this date, the banquet meal will not be available. This is a formal affair, so dress appropriately. If you have special needs while you attend the conference, such as dietary concerns or accessibility concerns, please let us know before July 26, 2019 by sending a written notification to mary@kemsa.org. After that date, we may not be able to accommodate your request. A refund, minus a $50 administrative fee, will be granted ONLY if cancellation is received in the KEMSA office by Friday, July 26, 2019 at 5 pm or as a result of circumstances approved by the KEMSA Board. No refunds will be issued for banquet tickets. The exhibit hall is included with a FULL conference registration. However, if you aren't attending the conference but want to come look, you can buy a vendor pass to visit the vendor area anytime it is open without buying a conference registration. These passes are $20 each. Vendors open: Friday, Aug. 9 - 0930-1800; Saturday, Aug. 10 - 0915-1130.